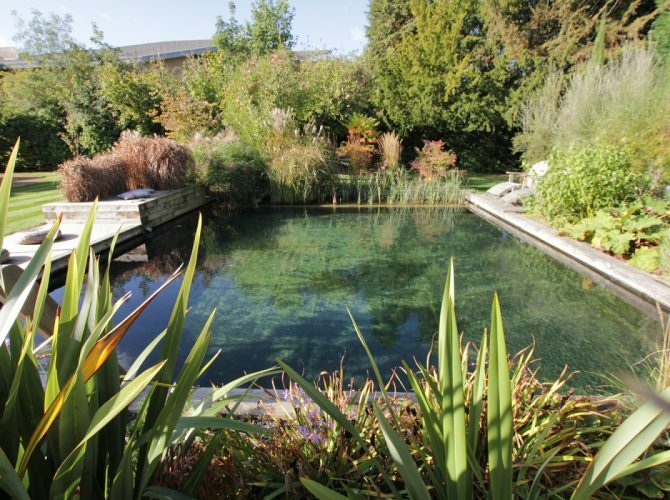 We present this small article on how to create a natural pool. We hope you like it and that soon you can make your ecological pool or reconvert the one you already have through the systems described here. 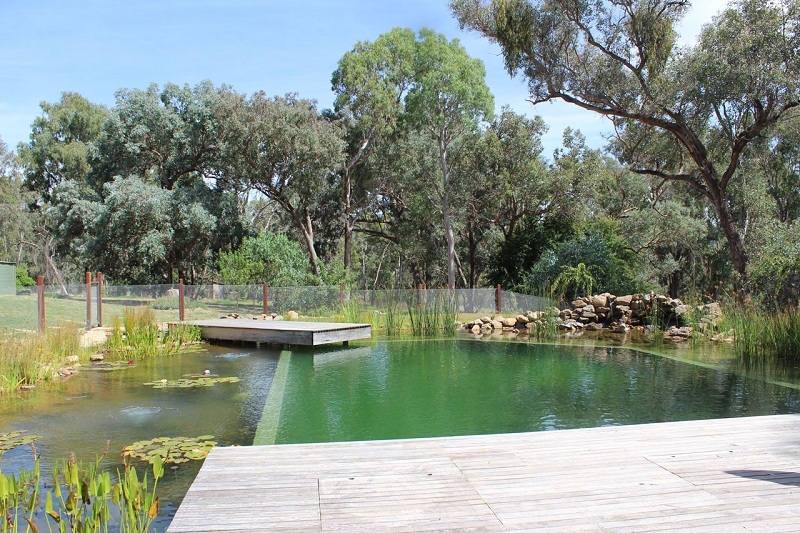 If you are interested in expanding the information that we collect here, you can sign up for our design course and installation of natural pools. A natural pool (also called ecological pools, naturalized pools, piscinas) is a pool where to achieve the quality of the water necessary for bathing, we use a natural purification system instead of using chemical products. This article will discuss the different ways to make this natural purification system. In this article we will not talk about how to build the glass of the pool since the glass of a natural pool can be built with various construction systems: shotcrete, concrete, liner, polyester reinforced with fiberglass, etc. a normal pool. In this article, we will discuss how to achieve water quality, that is, how to design the purification system. Criteria for visibility of the bottom drainage. 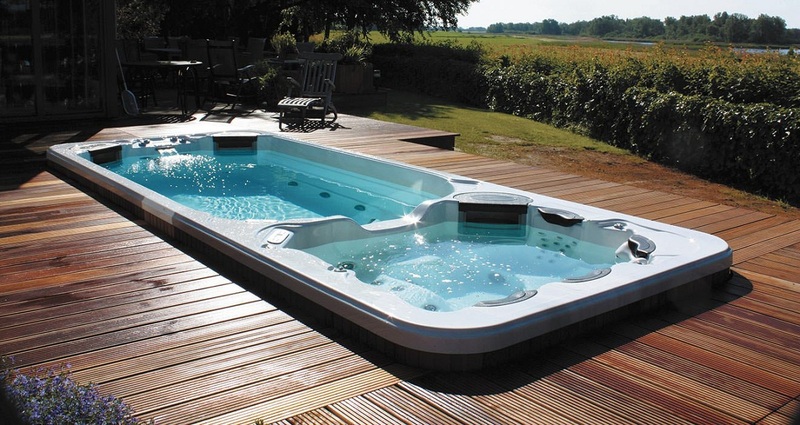 What happens to a conventional pool when we stop using chlorine? In any pool fall leaves, insects, scales of our skin, all this organic matter degrades and generates ammonia among other compounds. The accumulation of these compounds feeds algae that grow and die, which generates more organic matter and nutrients in a spiral of biomass generation is what is known as eutrophication. At this point the proliferation of unicellular algae causes us to lose the first quality parameter, the transparency of water. However this is not a parameter that affects our health, we could in principle give it up. However, eutrophication continues until the amount of organic matter in the pool is such that pathogenic organisms (“Escherichia coli”, Pseudomonas aureoginosa “and” Legionella spp “) appear that are harmful to health and are the real problem. These organisms appear in conditions of absence of sunlight (lack of water transparency) and accumulations of decomposing organic matter (masses of algae, dead leaves, dead insects) that generate anaerobic situations (lack of oxygen). To achieve the quality of water in a natural pool, all we have to do is cut the spiral of biomass generation and we will eliminate all these problems, achieving, in the majority of cases, that the water quality will be maintained in the aforementioned parameters. For this, we have to remove the organic matter from the system so we prevent the algae from feeding on it. 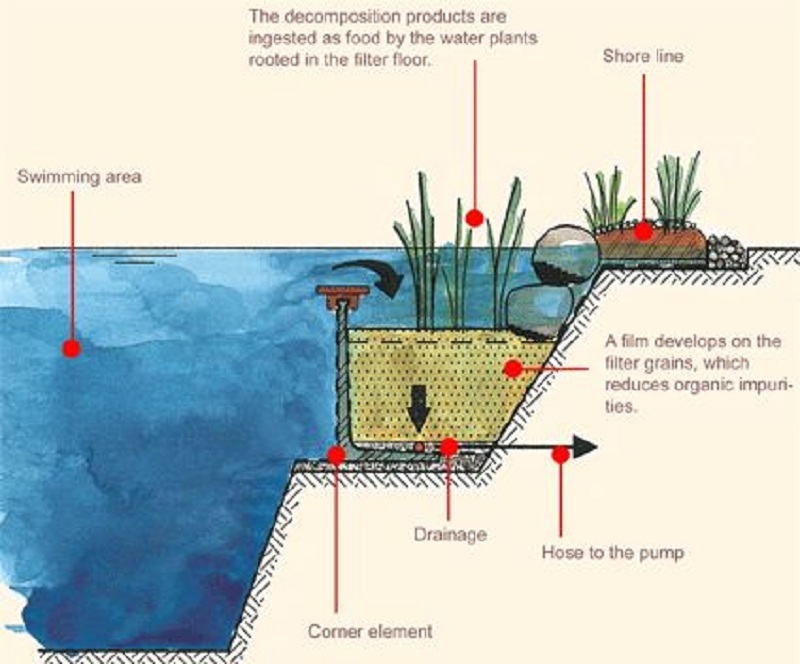 The aquatic plants are those that will perform this function of elimination of organic matter. However, the different types of algae are very effective at absorbing the different nutrients of the water as soon as they appear in the system; it does so before the plants, for this reason, we have to facilitate the absorption of nutrients to the plants, this We transform these nutrients by building a biological filter. What is a biological filter and types? The organic material in suspension in the pool water generates ammonia NH 3, ammonia is a nutrient for algae but not for higher plants, and is also toxic to fish and people. A biological filter converts ammonia NH 3, into nitrate, NO 3 through the supply of oxygen. The nitrate is perfectly assimilable by the upper plants that absorb it and eliminate it from the system so that it is not available for algae. A porous material where the bacteria can settle and create colonies: kaldnes, gravels, pozzolans, zeolites … the more porous the material, the more settlement surface the bacteria will have and the more effective the biological filter will be. Water with dissolved ammonia circulating through the filter. This is the water of our natural pool. Without it, the bacteria cannot carry out the process. We can provide oxygen by aerating the water with a waterfall, by means of air pumps and aerators or by spraying water. The biological filter of vertical or horizontal flow gravel. The filter consists of a series of stratified gravel submerged in the water flow. The gravels have different granulometry, of greater granulometry to lower in the direction of water circulation to ensure a constant and uniform flow (It is important that there are no areas without water flow, in these areas there is a lack of oxygen supply and can appear pathogenic bacteria, it is also convenient that there are areas with excessive flow where bacterial colonies cannot perform their work properly. 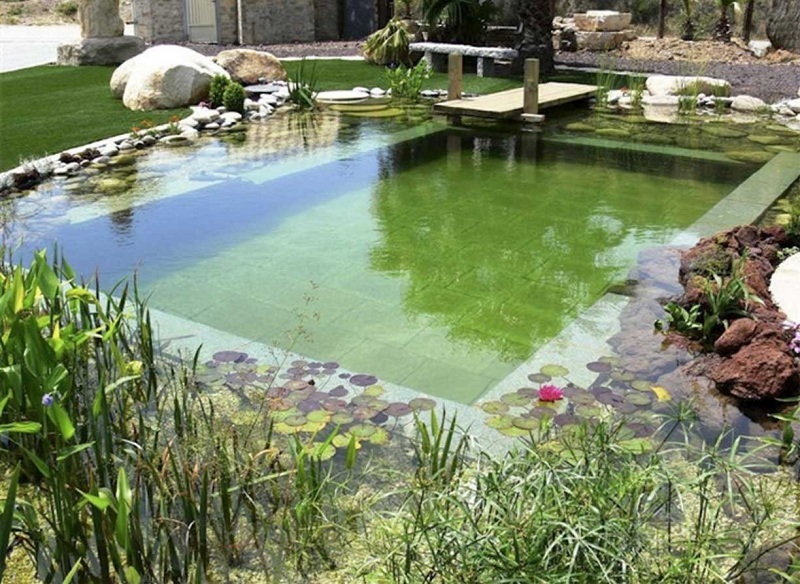 This biological filter is the most commonly found in all natural pools. We use gravel stratification on two levels: 80-100mm for water distribution and 20-30mm for biological filtering. The more porous these gravels are, the more surface colonies of beneficial bacteria we will have and the more effective our filter will be. This means that it is better to use volcanic gravel that gravels limestone. These biological filters can be planted, the roots of the plants increase the surface where bacteria colonies can form and also provide part of the oxygen necessary for the system to function properly. The circulation of water through this type of filter can be forced mediate a pump, or natural, by heating the water on the surface of the filter gravel. The main problem that can present this filter is the saturation of organic material and the appearance of sludge, which generate areas where the filter does not work properly due to lack of oxygen. Biological percolator filter. In this case we have a bed of gravel or other material that fills the filter but is not submerged in the water, the water is sprayed on the top of the filter and falls through the filter material to the bottom where it is collected and pumped to the pool is the water always in contact with the material (where the colonies of nitrifying bacteria settle) and with the air (availability of oxygen). It is a much more effective system than the previous one since the water is in permanent contact with the air, which guarantees a perfect oxygenation. To operate this system, we need a pump that allows water spray with spiders on the upper part of the biological filter. The biological filter of kindness. This type of filter is formed by a tank full of water that also contains, in a lesser proportion, a series of plastic pieces called kindness, these pieces are designed to offer a large surface area that can be colonized by nitrifying bacteria. An aerator is placed in the lower part of the filter that provides the oxygen necessary for the transformation of ammonia to nitrate. It is a very efficient system since the contribution of air causes the plastic pieces to collide with each other, destroying the film of dead batteries on the surface of the kindness and facilitating its regeneration. Zeolite filter. Zeolite filters deserve a mention apart, zeolites are a porous material is not only capable of harboring bacterial colonies but also capture ammonia molecules directly, for this reason, is very effective for use in filtering ecosystems. Zeolites are used in horizontal or vertical flow filters and it is recommended to use them with slow filtering flows for their correct operation. The main drawback of the zeolite filter is that this mineral progressively loses its properties, which requires a replacement or reactivation of the zeolites. Which can be a disadvantage depending on the size of the pool and the accessibility to these gravels in the system. The dimensioning of the filter surface varies depending on the size of the swimming vessel and the climatic zone where we are. It is not the same to size a natural pool in Berlin, Germany, continental climate, then in Alicante, Spain, Mediterranean semi-desert climate, the size of the biological filter for the second will be higher. Once we have managed to transform the ammonia into nitrate, we must absorb and remove the nitrate from the water, this is the work done by the plants in what is known as a regeneration zone. The pruning of the plants and removal of remains of them is key to the proper functioning of the natural pool, if we do not, when the leaves of the plants die they will fall into the water and generate more nitrogen, which will feed more plants entering a spiral of biomass generation until algae appear and finally the harmful bacteria that we want to avoid. The regeneration zone can be integrated in the biological filter, in cases where it is of vertical, horizontal or percolating flow; It can also be separated or integrated into the swimming pool, it can even be a floating island in the pool, there are multiple possibilities depending on the type of filter that we are going to use, the aesthetic appearance that we want for the pool or the level of technology that let’s install Depending on the latter, we will have different types of natural pools. 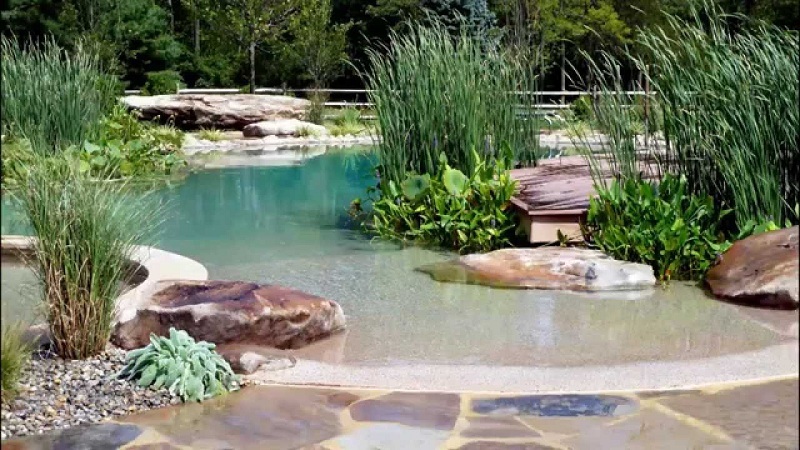 This type of natural pool uses a biological vertical flow filter integrated into the swimming pool, this filter also houses the plants, and that is, it is also the regeneration zone. The circulation of water occurs naturally by heating the surface of the water that circulates it through the gravel filter. The effectiveness of this natural filtering system is limited. The ecosystem takes several years to reach equilibrium and when it does, it is not possible to guarantee the complete transparency of the water, however, it is not necessary for the transparency to be complete so that the rest of the water quality parameters are correct. You can see this video in English about this type of natural pools. As you will see, the transparency of this type of pool is not total. If we add a pump to the system described in the previous point to recirculate the water in the vessel through the biological filter, we improve the behavior of the same, reducing its surface. aerators can also be used to fulfill this function of circulating the water through the filter. 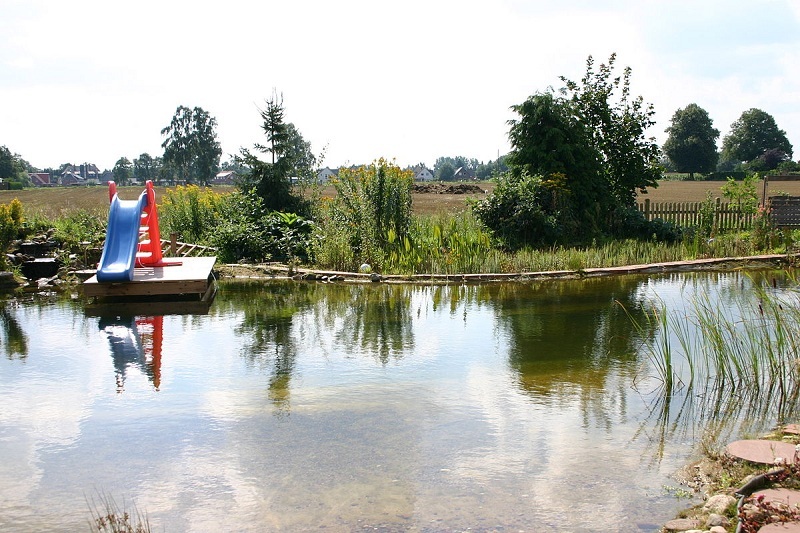 The type of natural pool described in the previous points all the elements that fall into the pool: leaves, insects … or we proceed to remove them manually or become part of the pool ecosystem increasing the levels of eutrophication. By simply implementing a skimmer and a filtering system we can remove this organic matter that falls into the pool making the system more efficient in an automated way. Sieve filter. It is a filter that automatically removes organic material from the pool. Scrubber algae filter. It is a filter where algae growth is favored so that they absorb the nutrients preventing them from proliferating in other areas of the pool. Ultraviolet filter. Eliminates unicellular algae from water in suspension, ensuring that the water is completely transparent. Zeolite filter. Eliminates ammonia compounds, one of the nutrients sources of algae. Phosphate reactor. Eliminates phosphates, another major source of nutrients in algae. It is not necessary to implement all these elements for the proper functioning of the pool, it is important, depending on the problem that we plan to provide the pool with certain systems in anticipation of possible problems. At the time of selecting the species for our pool, we will have to take into account several factors such as the climate of our area, the flowering times, whether the plants will have foliage all year round or not, the type of fauna that we are going to introduce … nevertheless we introduce the vegetal species that we introduce we must keep in mind that its function is to grow and to retire organic matter of the swimming pool, for this reason, they will work much better species with fast and invasive growths, since all this vegetal matter generated is nitrogen that we are removing from the pool.